Keratoconus is a condition that affects the cornea, the clear dome-like structure on the front part of your eye. Slowly and progressively, the cornea begins to bulge outward and become steeper. With keratoconus, you will become increasingly nearsighted and may develop large and irregular amounts of astigmatism. As your condition progresses, the cornea can develop scar tissue. In some cases, the steepening of the cornea can be so significant that it can be seen clearly without a microscope. As keratoconus progresses, you may begin to experience very blurred or distorted vision that is difficult to correct with eyeglasses. When this occurs, contact lenses are usually recommended by your eye doctor. If your cornea is significantly distorted, rigid gas permeable lenses or soft-rigid hybrid lenses are recommended. These lenses tend to totally vault the cornea, and along with what is called the tear lens (tears that fill in underneath the lens), mask irregular astigmatism, steepening or distortion. Although this method works very well in many cases, some people suffering from keratoconus become contact-lens intolerant, either due to dry eyes or possibly from discomfort associated with the steeping or scarring of the cornea. In some people with keratoconus, the cornea becomes so steep that it is difficult to get a rigid gas permeable lens from popping right out of their eyes. These people become debilitated and emotionally upset. Because eyeglasses are not able to correct their vision problem, and current contact lens designs are very uncomfortable, they lead a life that must compensate for their decreased vision. When lens options are exhausted, keratoconus patients are sometimes left with a treatment option that involves surgery and possibly a corneal transplant. 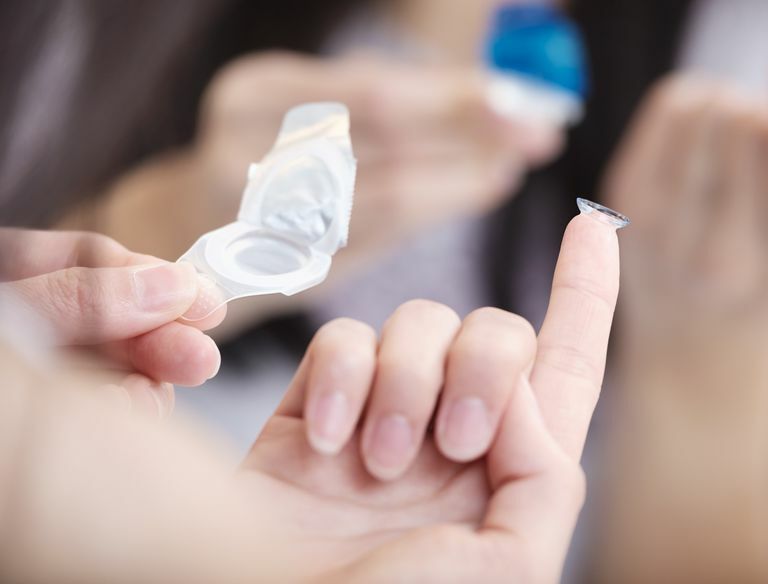 Recently, a new soft contact lens material has been developed that may help people who become intolerant of traditional contact lens options. Two new soft lenses have been introduced: NovaKone (Alden Optical) and Kerasoft IC (Bausch & Lomb). NovaKone: The NovaKone lens, introduced in 2011, offers five thicknesses that help mask corneal distortion and irregular astigmatism. What makes this unique and more successful for optometrists to fit is that the back surface of the lens consists of a different curve than does the peripheral part. The central curvature and peripheral curvatures may be changed independently of each other to improve the fit of the lens, and the lenses may be changed independently of each other. In the past, the thicker soft lenses would create a condition in which the cornea did not get enough oxygen to the cornea and created a very unhealthy environment for the eye. With the NovaKone lens, the tear exchange underneath the lens provides good oxygen flow. Once the patient and her optometrist are satisfied with the comfort and vision, the lenses are ordered in a four pack so that each lens is replaced every three months. Kerasoft IC: The Kerasoft IC lens, introduced in 2012, is made of a material called Definitive which has a high water content of 74 percent and consists of a silicone material that allows a very high oxygen flow to the cornea. As a result, the thickness of the lens does not create a poor biochemical environment for the eye. Like the NovaKone lens, the Kerasoft IC has a central curve and a peripheral curve that can be altered independently. Furthermore, a practitioner can even change certain sectors of peripheral curves to improve the way the lens fits on the eye. The initial lens chosen by the optometrist is based on corneal shape and the type of keratoconus, rather than just the curvature of the cornea. Like the NovaKone lens, this lens is also available in a quarterly-replacement four-pack per eye. Although soft lenses have been used in the past for keratoconus patients, compromises in either fit, best-corrected vision, or daily wearing time had to be made. With the advent of these new lenses, keratoconus patients now have another, possibly more comfortable option to correct their vision problems associated with keratoconus. Brujic Mile, Miller J. "The Comfortable Side of Keratoconus," Review of Cornea & Contact Lenses, a sub magazine of Review of Optometry, Pp 21-22, 25 Jan 2012.